March sees Jupiter high and conspicuous in our southern sky at nightfall as Mars brightens considerably and rises well before midnight on its way to opposition in April. Meanwhile, the Sun’s climb northwards means that it is already two and a half times higher in Edinburgh’s sky at midday than it was at our winter solstice on 21 December and by the end of March it will stand 38° high, almost four times higher than it did at midwinter. The moment when it crosses the equator comes this year at 16:57 GMT on the 20th and marks our spring or vernal equinox. Although this is often cited as the first day of spring, meteorologists now use 1 March as this milestone. The days are lengthening, too, and the sunrise/sunset times for Edinburgh change from 07:04/17:47 GMT on the 1st to 05:46/18:49 GMT on the 31st. We set our clocks forwards to British Summer Time on the 30th, so the latter times translate to 06:46/19:49 BST. With nautical twilight persisting for 84 minutes, effective darkness does not arrive until 21:13 BST as the month ends, less than one hour after our map times. Another consequence is that our sky at nightfall is changing quickly. 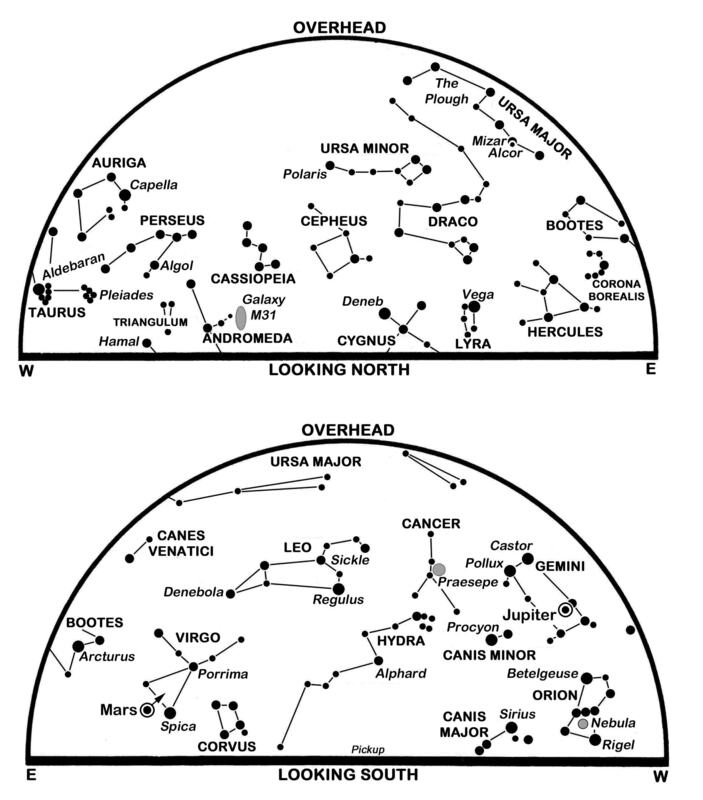 The glorious constellation of Orion the Hunter, for example, stands proudly in the south at nightfall at present but has shifted lower into the south-west by the 31st, taking with him Taurus and his faithful companion, Sirius the Dog Star. Our maps show him even lower in the west-south-west as his place near the meridian has been claimed by Leo the Lion whose main star Regulus shines in the handle of the reversed question-mark of stars known as the Sickle. Meanwhile, Ursa Major is soaring from the east to overhead. As I mentioned last time, it was in the galaxy M82 in Ursa Major that a group of students in London discovered one of the brightest and closest supernovae for several years. After peaking as an easy telescopic object near magnitude 10.5 in early February, that stellar explosion has now dimmed to be closer to the twelfth magnitude. It is Jupiter that really catches the eye during our March evenings. As the brightest object high in the southern sky at nightfall, it is slow-moving against the stars of Gemini, above and to the left of Orion and just 1.8° to the south of the third magnitude star Mebsuta. In fact, it reaches a so-called stationary point on the 6th when its westerly or retrograde progress against the stars reverses to a more usual easterly or direct motion. Such apparent changes in motion result from our changing vantage point on the moving Earth. The giant planet recedes from 695 million to 767 million km and dims slightly from magnitude -2.4 to -2.2. Binoculars show its four main moons while telescopes sometimes reveal the inky shadows of one or other of the moons on its cloud-banded globe which shrinks from 42 to 38 arcseconds. Chances to view Jupiter at its sharpest while high in the sky are beginning to run out – by our map times it is already sinking towards the west and it sets in the north-west before dawn. Our second conspicuous evening planet is Mars which rises in the east-south-east one hour before our map times and crosses our lower southern sky during the early hours. After its own stationary point on the 1st, 6° north-east of Spica in Virgo, it moves to lie 5° north of Spica on the 31st, as indicated by the arrow on our chart. Spica is a blue-white star of magnitude 1.0 and considerable fainter than the distinctively reddish hue of Mars which again doubles in brightness from magnitude -0.5 to -1.3. Due to reach opposition in April, Mars approaches from 121 million to 95 million km during March as its diameter swells from 12 to 15 arcseconds, large enough for surface markings to be glimpsed through decent telescopes. The northern hemisphere of Mars experienced its own midsummer in mid-February and the small white button of the northern polar ice cap is tipped 20° towards us in mid-March. Saturn, magnitude 0.4 to 0.3 and at a stationary point in Libra on the 3rd, rises in the east-south-east less than two hours after our map times and trails some 25° behind Mars, and slightly lower, as it crosses our southern sky before dawn. Venus continues as a brilliant morning star though its altitude in the south-east at sunrise falls from 12° to 8° and it fades a little from magnitude -4.6 to -4.3. Viewed telescopically, it shrinks from 33 to 22 arcseconds in diameter and changes from a crescent to slightly gibbous in form. While Venus is furthest west of the Sun (47°) on the 22nd, Mercury lies 28° west of the Sun on the 14th but is probably too low in the predawn twilight to be seen from Scotland. The Moon is new on the 1st, at first quarter on the 8th, full on the 16th, at last quarter on the 24th and new again on the 30th. Look for the young earthlit Moon low in the west-south-west at nightfall on the 3rd and 4th. It lies south of the Pleiades on the 6th and against the stars of the Hyades near Aldebaran in Taurus on the 7th. After passing south of Jupiter on the 10th, it lies below Regulus on the 14th and between Mars and Spica as they rise on the 18th. It has a close conjunction with Saturn on the morning of the 21st and stands just above Venus on the 27th. This is a slightly-revised version of Alan’s article published in The Scotsman on February 28th 2014, with thanks to the newspaper for permission to republish here.